Posted on Sat, Oct 17, 2009 : 5:15 p.m. 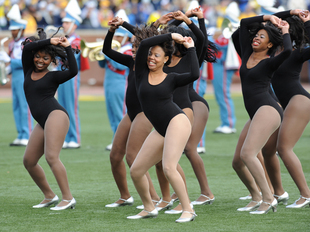 The dancers moved effortlessly two at a time into the Michigan Stadium tunnel and then disappeared through the small hole inside the cavernous stadium. So, too, went the Delaware State drum major, senior Matthew Brown, pumping his fists with flair, each step its own rhythm, its own movement to the beat. The football team may have been demolished on the field Saturday, outclassed in every physical way, but before the game, at halftime and afterward, it was all about Delaware State. That was when the band took over. More than anything athletically, except maybe former NFL wide receiver John Taylor, Delaware State is known for one thing: The band, which calls itself The Approaching Storm. “We are the ambassadors of the university, so we just try to instill school pride,” said Brown, in his second year as drum major. “Most of the crowd comes to see the band. Led by Randolph J. Johnson, they are to Delaware State what football is to Michigan and basketball is to Kentucky. The band has a full page in Delaware State’s media guide and the first line says “halftime is show time” in Dover, Del. Consider this. Delaware State’s band - 16 of them anyway - played with the Temptations in New York City in 2005. A year later, the band performed at the Super Bowl in Detroit at Ford Field. And that doesn’t compare to January of this year, where the Delaware State band traveled to Washington and played at the inauguration of President Barack Obama. “Playing in the inauguration, it was just fabulous, having Mr. Johnson come, practice hard, in the cold, pretty much, yeah, inauguration prepared us for here,” Brown said. In many ways, he was referencing both. Being a historically Black college and university, playing the inauguration for the nation’s first black president had to be special. And from a band perspective, playing in front 106,304 people Saturday had to be a musical thrill. But most of all, the band members look like they are having fun. They are constant movement and motion. The tubas sway with their feet as they play. The cymbal players keep time by moving their legs. At times, even when every band member stays in the same spot, they look to have continuous movement. It is a free-flowing form of expression, complete with the dancers up front. With red and turquoise uniforms, they have flair, dance moves and unlike many marching bands in college, some groove. There isn’t stiffness in Delaware State’s band but a fluidity in their movement and in their music, which happened to be a Michael Jackson medley during halftime Saturday. They are, simply, the stars in Dover. How else can you explain why fans show up at the start of Delaware State football games and then sometimes leave after halftime? They also gained a following in Ann Arbor. Toward the end of the post-game performance, the Delaware State band marched toward the south end zone to clear the field for one final Michigan Marching Band song. As they walked away, four young girls in Michigan clothing cheered for the Delaware State band, imploring it to play one more song. And other Michigan fans stood above the tunnel, taking pictures as the Delaware State band exited the field. They stuck around to see them because it is not every day a band comes around and is more anticipated than the football team. Saturday, that’s exactly what happened. “It’s a great experience, a fantastic experience here in the Big House, Johnson said. “You hear about it, you see it on TV. Wed, Oct 21, 2009 : 10:25 p.m.
Great article! The essence of the Band and the students passion towards their art really came through. Even if I am a little biased towards The Approaching Storm, DSU Alum and parent of a band member. Sun, Oct 18, 2009 : 10:41 a.m. Looked just like a scene out of "DRUM LINE" a movie I liked. Sun, Oct 18, 2009 : 10:27 a.m.
Nice story mike. Keep up the good work and bury the mean nasty Mike. I don't like him very much. Sat, Oct 17, 2009 : 10:04 p.m. This shows what you know about HBCU's!For many of the HBCUs,the Band is the attraction!They actually have battles(like battle of the bands)b/c their football teams(most of them)are not that good.So if the crowd won't pay to see the teams,us being Black People,will pay to hear and watch the bands! 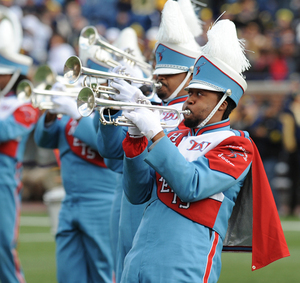 !Not to mention.....they are good!So even though it seems like this is an eye-opener for you,this has been going on FOREVER on most HBCUs!So don't be shocked b/c Ann Arbor/Michigan fans want to see,hear,and even take pictures of Delawares States Band.....they are that GOOD! !Even Michigan fans realize this.People broaden your horizens and check out some HBCU games.You won't be dissappointed in the experience(if you love good music and good bands).Good luck against Penn St. next week and GO BLUE!!! Sat, Oct 17, 2009 : 9:10 p.m.
or schedule FIU for the cheerleaders: http://sportsillustrated.cnn.com/multimedia/photo_gallery/0910/campus.cheer.fiu.vanessa/content.1.html good story on the Del State band!